Timeline for Ellen Nora Payne (nee Field), 1914 to 1933 • Who was Nellie Payne? 3rd May Nellie comes second for her carved American Walnut bookcase in the most popular exhibit competition (misses out by one vote) at Launceston Arts and Crafts Society Exhibition. This bookcase is for her son, Alan Field Payne, DB75. 18th July Nellie elected to committee of the Tasmanian Arts and Crafts Society Hobart (with a Mr Payne). Nellie carves Blackwood dower chest for Miss Grace Dangar, “Baroona” NSW Design peppermint gum and Tasmanian flying squirrels, DB97. Headmaster’s chair carved for Friends’ School, Hobart, DB59. Son, Geoffrey enlists, then her other son Alan, and also Dr Payne. Nellie designs and creates ‘The Queen Mary Book’, DB124. Nellie conducted private classes in woodcarving and volunteered as an instructor in handicrafts for disable returned soldiers. 10th July Nellie elected to committee of the Tasmanian Arts and Crafts Society Hobart. Nellie carves the pair of overdoors in the hall at “Westfield”, Westbury, Tasmania, in Blackwood. Names of original owners of the estate William Field 1825 (Nellie’s grandfather) and Thomas William Field 1936 (Nellie’s father). Motto taken from an old door in Portsmouth, England. “Peace to all who enter. Safely to all who go out. Blessings to the dwellers”, DB80,81,82. Nellie presents chair to Friend’s High School, Hobart, Tasmania. Old Cedar carved with peppermint gum and Tasmanian Brown owls. Carved as a memento of Alan Field Payne’s school days, DB59. Katie Lade (Clark) dower chest, DB111. 23rd August Nellie holds an exhibition at home for Red Cross fundraiser. 10th May Nellie’s daughter Madge helps Mrs R. C. Lilian Field (Aunty) with produce stall at St Andrew’s Church Annual Autumn Fair at Westbury. Andrew’s Church Annual Fair at Westbury. Nellie carves chest for Geoffrey Charles Payne. Copied from an old 16th Century chest belonging to F J Young Esq which was brought to Hobart from Venice in 1889, DB85. Nellie carves Westbury roll of honour. Central panel shows Goddess of Fame holding wreath of honour and trumpet of fame. Below is the seat of war shown on the globe, DB36. Nellie carves Blackwood Font cover during Easter for church at Ouse, Tasmania, DB173. 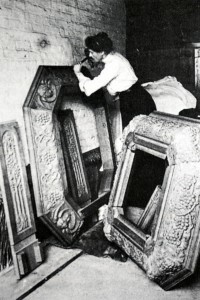 Nellie carves Blackwood memorial gothic screen for the side chapel of All Saint’s Church, Hobart, Tasmania, DB12. Hymn Board placed in church at Lower Sandy Bay by Nellie’s sister (Sara Jane Whiteside) ‘In memoriam – Marie Lindsay Davies’ (née Whiteside), Nellie’s niece, who died aged 24 years old of meningitis 19th August 1914, DB20. 19th October Nellie carved Blackwood altar rails in the church at Kimberley Tasmania. Erected to the memory of Sergeant Lindsay McRae Field (Nellie’s nephew – son of George Westfield Field) by relatives. Killed in action in the Battle of Gaza World War, aged 23 years old. Dedicated by Bishop Stephen, DB173. Nellie’s son Alan named Rhodes Scholar – small party to celebrate as world is still at war. Nellie designs and carves Naval and Military Clubs Presidents Board requested by son Geoffrey, DB178. 5th June Nellie presents carved chair in walnut wood as memorial to Lindsay Field (nephew) for Launceston Church Grammar School, at the top is the winged globe with cobras, the most sacred emblem of divinity of the Egyptians, on the arms is the scarab or sacred beetle, held to be a charm to keep off evil spirits. The key of life. The lotus flower meaning immortality, the red pyramid badge of the Camel Corps and black and white of the 3rd L. Horse are shown on the chair, DB61. Carves plaque for Bethune brothers for Church of St John the Baptist, Ouse, Tasmania. Memorial tablet in Blackwood with Bethune family crest. Wreath of gum leaves and seeds. Colours of blue and yellow of the 8th light horse inlaid, DB128. Memorial lectern in Blackwood for St John’s Church, Franklin, Tasmania, for Phillip Douglas Davies, 12th Battalion A.I.F killed in action WW1 (former Westbury Bank Manager), DB129. Blackwood memorial altar for Mrs Fawns (wife of Rector) in All Saint’s, Hobart, Tasmania, DB13. Nellie carves memorial altar for Major Justin Hutchinson, DB130. Nellie carves writing table made from old mahogany for Mrs Flexmore, DB174. Lower Barrington Honour Roll, DB43. Visitors book, Hutchins School, Hobart, Tasmania, DB53. Nellie presents Collegiate School a carved memorial chair for Katie Daniels nee Wood, DB54. Nellie carves Kimberley Honour Roll of the Great War, DB38. June Nellie presents chair to Bishop Stephen by the Collegiate School, Hobart, DB175. Nellie carves Bothwell Honour Roll of the Great War, DB33. Nellie’s gifts presented to British Royal tour party – Presentation address in the form of a leek made of white kid leather. DB176. 7th April Nellie carved the Swansea Honour Roll placed in Council Chambers honouring WW1 Glamorgan Soldiers, DB34. 28th April Nellie exhibits WW1 memorial carved pieces (for Harry B. Eddington, Ernest F. Besier and Leslie W. Hyland) at Tasmanian Arts and Craft Society, Hobart Annual Exhibition (event attended by Lady Allardyce and her daughters Keva and Viti whom Nellie carved dower chests for at some stage). Nellie re-carves portions of the her original 1919 Honour roll for Roberts and Co. Hobart Tasmania as the cedar wood was partly destroyed by office fire, DB41. St Stephen’s Honour roll, DB19. 21st August Nellie unveils memorial plaque for Sholto Blyth at Launceston Church Grammar School, DB64. 13th September Nellie exhibits Roll of Honour for Webster Co. and is judge for raffia and leatherwork section at Tasmanian Arts and Crafts Society Hobart Exhibition – Lady Allardyce opens. Nellie’s gift to Prince of Wales acknowledged in English newspapers. Nellie carves Honour Board for Hutchins School, Hobart, Tasmania, DB45. Dorothy Field Dower Chest, DB95. Prefects book – Hutchins School, Hobart, Tasmania, DB52. Nellie carves Honour Roll for the soldiers who returned from the Great War and another Honour roll to the memory of the fallen soldiers for the Sheffield community in Tasmania, DB35. 11th October Nellie attends unveiling ceremony of Honour Board at Hutchins School Hobart. DB45. Nellie carves a chest for Mrs Louis Agnew’s. Blackwood with iron lockplate and handles, DB109. Mollie Field Dower Chest, DB93. All Saint’s Church, Hobart, Honour roll, DB14. Nellie carves Honour roll which is placed over fireplace in the Library of University of Tasmania. Blackwood grape design and wreath of peppermint gum, DB30. Nellie carves chest for Mrs C T Butler. Blackwood, iron handles and lockplate, DB 100. St David’s Cathedral Alms box, DB16. St Luke’s church, Campbell Town Honour Roll, DB184. Perpetual shield in memory of Major John Foster, DB181. Nellie exhibits work at the British Empire Exhibition in Wembley London UK – Blackwood screen. Design peppermint gum coat of arms of Tasmania and motto. Also Kiplings lines. Reverse side contains Tasmanian native animals – Ringtail opossum, Opossum mice, Morepork (owl), and Flying squirrel, DB78. Nellie receives a commemorative medal for Blackwood screen – commissioned by Tasmanian Government. June Nellie carves Memorial Board for Clarence Municipality – names of the 56 men killed in the Great War. Placed temporarily in the Post Office at Bellerive, Hobart, Tasmania, DB32. 13th September Nellie carved University of Tasmania Honour Board which was unveiled by General Sir John Gellibrand commissioned by Hon Tetley Grant MLC, DB30. 19th December Nellie carves Sports Cabinet for Launceston Church Grammar School, Launceston, Tasmania, commemorating Field family ‘old boys’, DB63. Blackwood cupboard presented to the Church Grammar School Launceston, Tasmania by the Old Boys of the Field Family (seventeen) whose names are carved inside the door panel. Design contains a Ringtail opossum, Flying squirrel, Peppermint gum, and Newbolt’s words along top panel. Nellie carves Blackwood memorial plaque for the Memorial Rest Home, Lindisfarne, Tasmania, DB127. Mrs C. A. Payne, of Hobart, has recently complete and presented to St. Andrew’s Church, Westbury, a handsomely carved honor roll, in Tasmanian Blackwood, containing some fifty names of those belonging to the parish, who served in the Great War, amongst they being the names at those who gave their lives. The ceremony of unveiling and dedicating this memorial will be performed by the Rev. J. W. Bethune, headmaster of the Church Grammar School, and some time chaplain to the forces at Claremont Camp, on Sunday March 15, at 3 p.m. It is hoped that as many relatives and friends as possible will be present at this function. 1925 was a very sad year for Nellie with her youngest son, Alan Payne dying, followed seven months later by her husband Dr Payne. 24th April Nellie opened and dedicated Alan Field Payne English oak plaque for the War Memorial Library at Hutchins School, Hobart, Tasmania, DB50. 14th June Nellie dedicated Honour Roll and Enlisters’ Board for Launceston Church Grammar School, Launceston, Tasmania. Launceston Church Grammar School roll of honour. Blackwood. School badge lettering in school colours. Blue and black for returned men and white and black for fallen, DB62. Nellie holidays with family at ‘Westfield’ near Westbury in the North of Tasmania. Nellie carves ‘Westfield’ lobby woodwork while on holiday. 25th November Nellie exhibits ‘carved screen and two large chest exquisitely carved’ at Tasmanian Arts and Crafts Society Hobart Annual Exhibition (woodwork judge – A C Walker). Nellie completes carving of Blackwood honour roll for Sassafras Methodist Church, DB37. Table for Girl Guiding Camp, Foxlease, England, DB165. Alan Field Payne memorial tablet, DB163. Credence table, St Thomas’s Church, Hobart, DB21. April Nellie designs and creates a ‘White Rose of York’ in white leather and seed pearls, mounted on green leather case laced with gold. Presented to the Duke and Duchess of York in Hobart, Tasmania, during their Royal visit DB135. Nellie writes the inscription on the Glenorchy State Schools Honour Roll but she did not carve it, DB196. Nellie carves dower chest for great-niece Dulcie Field (Nellie’s cousin John Charles Field’s grand-daughter) on her marriage Oct 9th 1928. Her monogram surrounded snake forming unending circle the emblem of Eternity, grapes and love birds, DB105. Nellie’s niece Isabella Alice Wisewould dies in Elsternwick Victoria. Nellie carves a chest made from 100 years old cedar taken from an old house in Clarkes’ timber yards, Collins St, Hobart (there is a secret drawer inside), DB29. Prayer Desk – St John’s Church, Ross, Tasmania, DB26. Nellie carves dower chest for Marie (Marjorie) Westfield Field, George Westfield Field’s daughter. She marries Ivan Ibbott. Stringy bark apple design, DB92. 27th October Minnie Piesse Memorial lectern carved by Nellie is dedicated at Holy Trinity Church Hobart, DB193. Nellie completes carved bookcase memorial for Hutchins School War Memorial Library with English oak panels below, DB47. Reredos All Saints church, Hobart, DB182. 6th September Nellie exhibits ‘carved memorial panel’ for Longford C of E Church (Rev Tarleton) at Tasmanian Arts and Craft Society Hobart Annual Exhibition (President Mr Alan Walker). Coat of Arms – Royal society, DB180. Nellie made Life Member of Hutchins School. Susan Ayton Memorial rectors stall, DB194. Cranbrook ship “Emerald” dedication, DB183. 24th September Nellie exhibits ‘magnificent chest carved’ at Tasmanian Arts and Craft Society Hobart Annual Exhibition. Wanda Piesse Dower Chest, DB108. Nellie’s sister Ethel carved altar for St George’s church, Invermay, Tasmania, DB195. Reredos and alms box – St Andrew’s Church, Westbury, Tasmania, DB6. 25th April Nellie presents Hutchins School with Presidents Chair, DB44. 11th November Nellie presents, on Armistice Day, Hutchins School’s Headmaster a Blackwood chair with military A.I.F. badge and the School badge and motto. 18th August Nellie carves a Centenary Shield for Football Competition presented to school by parents Association of Hutchins, DB48. 19th September Nellie judges leatherwork at the Tasmanian Arts and Crafts Society Hobart Annual Exhibition.